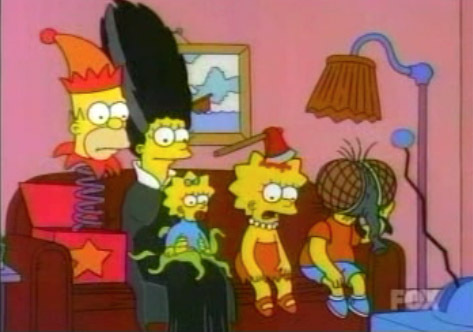 You really can’t go wrong with The Simpsons ‘Treehouse of Horror’ Halloween specials. It’s hard for me to pick a favourite segment, but I’d probably settle on “The Shinning” lampoon of “The Shining”. I also love the story of Homer selling his soul for a donut and Ned Flanders being the devil. Mrs. Sip and I went back last year to watch every single episode, but only managed to get through 15 of the 23 shows (now 24)… on the plus side, that leaves us with nine airings to go through this year, leading up to the 31st! Roseanne featured a Halloween episode every year from 1989 to 1995. The Connors were a wild bunch that loved Halloween perhaps more than any other time of the year. The whole family got into the spirit, with decorations around the house and wildly imaginative costumes. The best episode may be 1989’s “BOO”, which featured the family hosting a haunted house in their home and Dan and Roseanne taking turns trying to scare the crap out of one another. 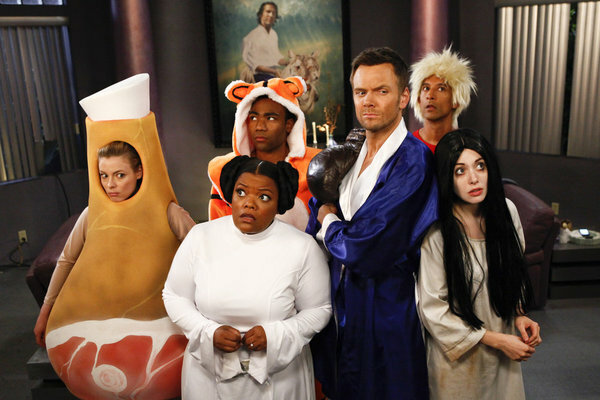 Every season of Community’s existence has featured a Halloween-themed episode and hopefully that continues in season five. The show has celebrated Dia de los Muertos (Day of the Dead), examined what would happen if a zombie apocalypse took over the school, tried to figure out which member of the study group is a potential homicidal maniac, and ventured through a seemingly haunted house to rescue their friend. What could be next for the gang? With all of Tim ‘The Tool Man’ Taylor’s hapless home renovations and gadgets, you knew each time Halloween rolled around that there would be mayhem and macabre in the household. Tim is also big into Halloween pranks, something that his family has also gotten into the spirit of as they try to get back at their father/husband. Watch a few of these and you’ll be interspersing your laughing with the odd grunt or two! The Office was always good for viewing because it gave you touches of what you experience in your own daily working life. That includes the yearly ramp up to Halloween at, well, the office. The costumes worn by the characters have been full of gags, like Michael’s two-headed monster, all the women dressed as cats, and Jim’s lack of enthusiasm for choosing a getup, his outfits including three black dots (Three-Hole Punch Jim), wearing a “Dave” nametag, and writing “BOOK” on his face (Bookface). Have I missed your favourite show? Give me hell and let me know what to watch this or next Halloween season! This cocktail was pretty tasty. The only downside was having so much Black Licorice leftover, but I was able to pawn them off on Pa Sip. All the ingredients combined to make a sour, flavourful martini… a much better experience than getting bit by a spider! 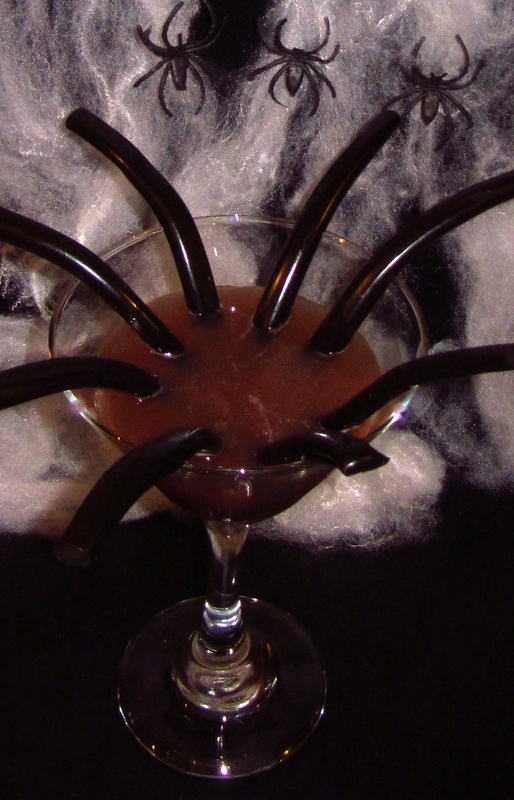 This entry was posted in Martini Recipes and tagged Black Licorice, cocktail, Community, Cranberry Liqueur, Day of the Dead, Dwight Schrute, Halloween TV Episodes, Home Improvement, lemon juice, martini, Michael Scott, Pama Pomegranate Liqueur, Roseanne, Spider's Bite, The Connors, The Office, The Shinning, The Simpsons, Tim ‘The Tool Man’ Taylor, Treehouse of Horror, triple sec, vodka by Daniel Wilson. Bookmark the permalink. Many years ago Jeff Foxworthy had a short-lived TV series that had one of the best Halloween episodes showcasing the family’s decorated home. One of the first TV episodes where the home was decorated inside and out.